According to the Chinese calendar, 2019 is the Earth Pig Year. This year starts on February 5th of 2019 and ends on January 24th of 2020. 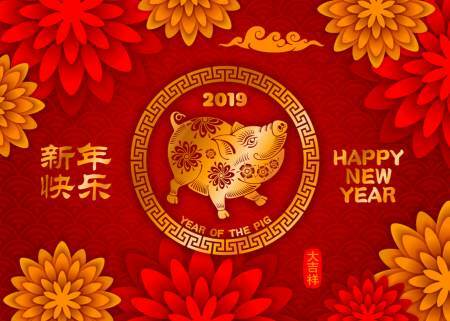 The chinese astrology specialists believe the year of the pig 2019 is a good year for giving birth. The Earth is a symbol associated with longevity, stability, self-control, and those born this year shall have plenty of great things in their lives. The best months of 2018 for giving birth are: May, June, July, August and September. According to the Chinese wisdom, it seems that the best chances of having a baby boy are if he is conceived in July and if the mother is 18, 20, 30 and 42 years old. The best chances for having a baby girl occur if she is conceived in April and the mother is 21, 22 and 29 years old. Also, according to the same Chinese chart, the chances of conceiving a boy start from 54% in all cases. The child born under the Pig Year is lucky, courageous, joyful, undemanding, nice, patient, resilient, a skillful organizer and has the ability to get under everyone’s skin with ease. The Pig child is gallant, old fashion and obeys the good manners code. The child is worthy of trust, a good listener, a bit naive, and modest. The child born in the Pig year is strong, understanding and has a rather big appetite. The Pig child is resourceful, delightful, and understanding when it comes to the needs and wishes of others. Also, the child has a kind soul and is honest. The Pig children want to have as many friends as possible. The natives are loyal, caring and seek mutually beneficial partnerships. They are always ready to help a friend in need. They can live in peace and harmony with the intuitive Rabbit and with the good-looking Goat. But they will be easily fooled by the tricks played by the Monkey who will take full advantage of the Pig native’s kindness. The children born under the Pig sign need the protection of their parents. Because they have a kind soul and they are a bit naive, they can be easily tricked by the other children. They are always ready to help their friends because they can’t say NO. They need guidance to sharpen their skills in setting barriers when they are needed. The parent-child relationship is pleasant, with no significant turns of events. Exactly because of their sociable nature, sometimes those around them tend to take advantage of them. Although they are admired, they are also the target of those who want to take advantage of their kindness. Since childhood, the Pig natives are inclined towards domains that develop their intelligence, they always want to know, to read and they have great chances to become genuine intellectuals when they grow up. Achieving small things is not their goal. They will always aim as high as possible and most of the time they will succeed in their plans. One thing that stays in the way of this native is naivety. The parents will notice this trait of the child’s personality, a characteristic not quite positive and they will try to correct it. Disadvantages: excessively pessimistic sometimes, they go very fast from one extreme to other and they can easily transform into snobs. Compatibility: The Pig native is compatible with the Dragon, Tiger, and the Goat natives. At the opposite end are the Rooster and the Snake natives. The children born in 2018 have an overall good health. Usually, they are active, they like sports, movement, they are interested in traveling and they enjoy the thrill of extreme sports. Are you born under the Rat sign and you want to know how to plan your pregnancy depending on your zodiac sign? It’s all about compatibility. The Rat mothers are compatible with children born under the Dragon sign (1976, 1988, 2000, 2012) and the Monkey sign (980, 1992, 2004, 2016). Manners and appearances are very important to you and a child who is not similar to you in this regard would give you headaches. The mothers born under the Ox, Horse, and Goat signs are always traditional and they would be more compatible with children born under these 3 zodiac signs. The Tiger mothers are fearless and, sometimes, a little narcissist. Out of all mothers from the zodiac, you are the one who dreams of the day when you can dress your child the same as you. The mothers born under the Tiger sign will get along with Goat (1979, 1991, 2003, 2015) and Pig (1983, 1995, 2007, 2019) children. As a future Rabbit mother, you will be the most caring mother out of all zodiac signs. You are going to know what the baby wants even before he or she starts to cry. Children born under the Dog (1963, 1975, 1987, 1999, 2011) and Horse (1990, 2002, 2014) zodiac signs will thrive next to a Rabbit mother because they need all the attention they can get. The Dragon mothers have everything under control. They value cleanness and order to the point they become obsessed. A compatible child will be born under the Monkey (1980, 1992, 2004, 2016) or Rat (1984, 1996, 2008, 2020) signs. The Snake mothers are perhaps the calmest ones from all the zodiac signs. They want only the best for their children and the happiness of their kids comes in the first place. The compatible signs for children are the Rooster (1981, 1993, 2005, 2017) or the Ox (1973, 1985, 1997, 2009). The Horse mothers are often very independent and difficult. They can be rather strict and very exigent. The compatibles signs with the Horse mothers are Tiger (1986, 1998, 2010), Goat (1991, 2003, 2015) or Dragon (1988, 2000, 2012). The Goat mothers are full of energy, they love to have fun and they are always optimistic. They encourage their children to enjoy and live their life the way they want and to explore any opportunity. The compatible children are born under the Rabbit (1975, 1987, 1999, 2011) and Horse (1990, 2002, 2014) signs. You will have fun together and you will explore the world next to each other. You will be that mother-child duo that everyone envies! The Monkey mothers are the “fathers” of the maternal zodiac. They are often more strict and more exigent than the fathers and, without fail, they will command respect in any situation. The compatible children are born under the Rat (1984, 1996, 2008,2020), Tiger (1986, 1998, 2010), and Pig (1995, 2007, 2019) signs. The Rooster mothers are extremely patient and very good listeners. They encourage their kids to think freely and to try until they succeed. A compatible child is born under the Dragon (1988, 2000, 2012), Dog (1982, 1994, 2006, 2018) and Snake (1989, 2001, 2013) signs. The children born under these zodiac signs value the connection between people as much as you do. The Dog mothers are extremely passionate about their children. A good thing for a baby, but not so pleasant when the child grows up. Instead, they help their children express their ideas, with no restrains on their creativity. If everything goes according to your plan, you will have a Dragon (1988, 2000, 2012), a Horse (1990, 2002, 2014) or a Tiger (1986, 1998, 2010) child, the most compatible signs with your own zodiac sign. If you are a mother born under the Pig sign, it is certain that disorder and stress are not big issues for you. You are a naturally relaxed person and trivial matters don’t have the power to upset you. From an astral point of view, it would be easier for you if you give birth to a Goat (1991, 2003, 2015), Dragon (1988, 2000, 2012) or Rabbit (1987, 1999, 2011) child.